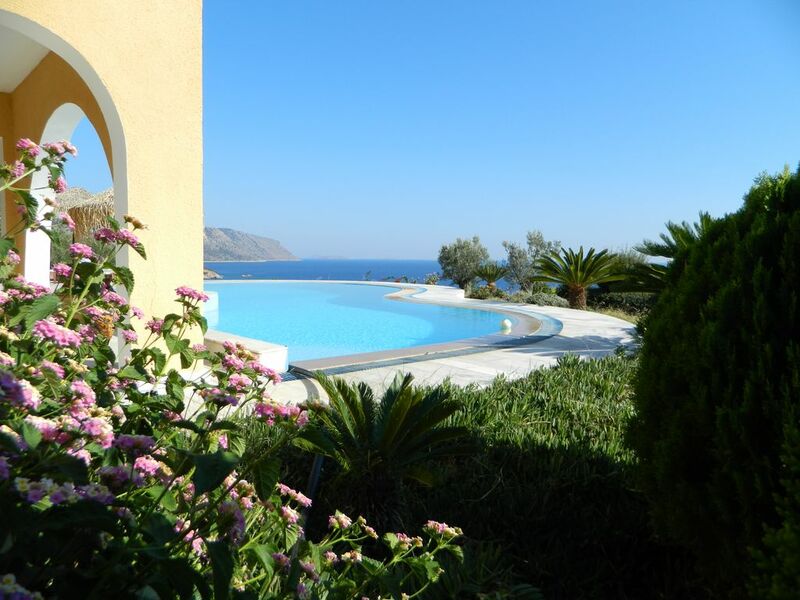 A Private Villa at a Prime Location, Just Off the Rocky Shore. Swimming Pool. A private villa at a prime location, just off the rocky shore, offers a peaceful haven for those wishing either to spend their time relaxing or as a base to explore the East Peloponese. Close proximity to local hotel club facilities for those looking for water sports etc. The picturesque village of Ermioni with its small marina, the cosmopolitan Porto Heli , the beautiful Island of Spetses (by 10 minute water taxi from Costa, near Porto Heli) and The Ancient Theater of Epidavros. Car rental is considered necessary. Private, 2 storey villa built on an incline in its own fenced-in, partly landscaped, property lying almost on the waters edge, just above the rocky shore, comprising of: Ground floor (pool level): open plan fitted kitchen, dining area and living room with double sofa - bed exiting to the swimming pool. Twin bedroom (with its own exterior door) share a wc / shower which interconnects with living room. Bedroom air conditioning, Coffee / Tea Making Facilities, Fireplace, Portable Stereo, CD Player, DVD, Television, Washing Machine, Barbecue (exterior built in), Oven traditional (built in), Parking (open air), Sea View, Sun Terrace, Swimming Pool. Service : Maid Service (6 hours) every second day. Linen change every 3-4 days. Gardener. Pool man. The property was ok, nothing to write home about but clean and roomy. The Pool Area was top shelf the deck, the pool the grounds and the VIEW!!! Very Quiet 10 min from town. 2 min walk down a hill to the sea. A family with two teenage boys were all pleased with this property. the house was amazing with an incredible view from the swimming pool . very clean and well equiped . Ermioni village (local market, rent-a-car, tavernas, bars and banks) at CA. 7 kms, Porto Heli (night life, restaurants, bars, banks etc.) at CA. 20 kms. Spetses Island and Epidavros, Nearest beach 150 m (pebbly). French club hotel facilities at CA. 600 m.